157781 Sapper W.H. 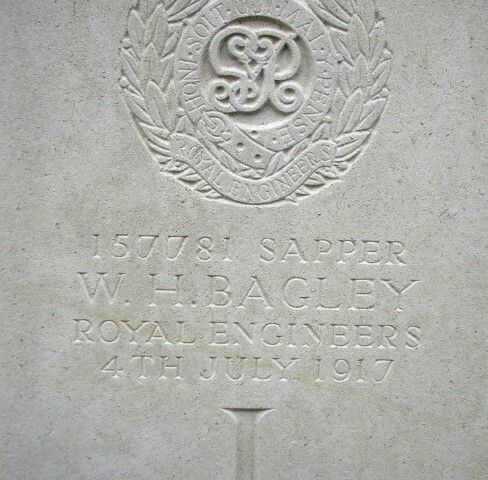 Bagley, 177th Tunnelling Company, Royal Engineers died 4 July 1917. He was about 24 years old, the son of Sylvester and Elizabeth Bagley. He is buried at New Irish Farm Cemetery, near Ieper, Belgium and commemorated on the St. Helen’s Colliery Memorial Cottages, West Auckland War Memorial and the Roll of Honour, West Auckland Memorial Hall, Darlington Road, West Auckland. The service record of Sapper W.H. Bagley and the War Diary of the 177th Company, Royal Engineers has not been researched. 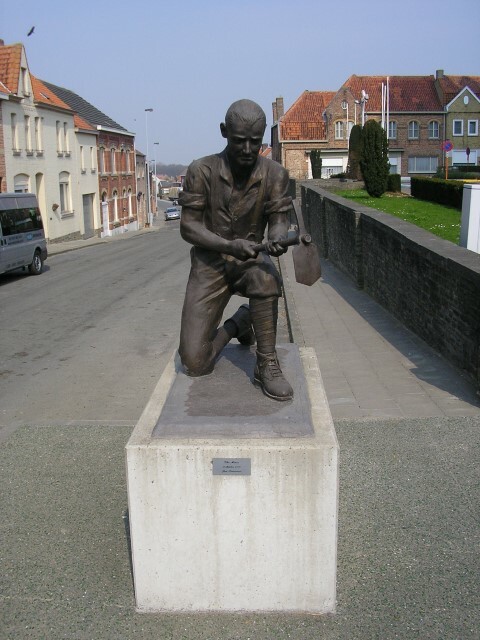 The Battle of Messines took place between 7 and 14 June 1917 and the main feature was the success of mine warfare. 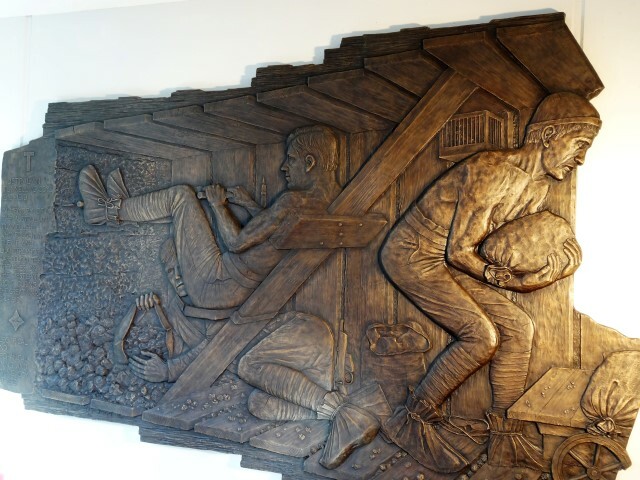 The 177th Tunnelling Company was heavily involved in the action. “The culmination of mine warfare on the Western Front was the Second Army attack on the Messines Ridge on 7 June 1917. In conjunction with the most powerfully concentrated artillery barrage to that date, 19 deep mines with a total of 937,450 lb of explosive were fired along the 10 km front at zero hour, all within 30 seconds of each other. The explosions were clearly heard in London and registered on a seismograph in Switzerland. The German defence was totally shattered with several thousand German troops obliterated by the explosions. One of the most strongly fortified positions on the Western Front was taken within an hour or so with few casualties to the attacking Divisions. The concept of a deep mining attack against the Messines Ridge was first proposed in early 1915 by Major Norton Griffiths. The first of the tunnels was initiated in July 1915. In January 1916 General Sir Herbert Plumer (Daddy Plumer) approved an all-out effort. At peak 9 Tunnelling Companies were employed on the preparations, including all three Canadian Companies. Many of the mines were in position by mid 1916 and had to be preserved and defended for a year or more. 25 mines totalling 1,149,450 lb (522,500 kg) were laid. One was lost to German counter mining, one abandoned due to tunnel collapse, and four at the southern end of the Ridge (Birdcage Sector) not employed for tactical reasons. 19 totalling 937,450 lb (426,110 kg) were fired. The largest single charge was the St Eloi mine at 96,500 lb (43,600 kg). One of the four Birdcage mines exploded in a thunderstorm in July 1955. Five fully charged mines containing 166,000 lb (75,500 kg) remain today. He was awarded the British War and Victory medals. This infers that he did not enter France until after 31 December 1915. His medals were issued to Mrs. L. Longstaff, 10 Bridge Street, Crook, County Durham. It is assumed that she was his mother-in-law. 157781 Sapper W.H. Bagley, 177th Tunnelling Company, Royal Engineers is buried at grave reference XXVII.D.16 New Irish Farm Cemetery near Ieper (Ypres). There are 1449 burials at this cemetery.